Editor’s note: This piece is part of our ongoing Equity, Diversity, and Inclusion (EDI) Project created to spotlight millennials’ voices and thoughts on diversity and justice. We urge you to read how this project came together in collaboration between NPQ and the Young Nonprofit Professionals Network and about the ideology behind this series. We intend to publish another 16 pieces in the coming months. Readers will be able to subscribe to an RSS feed to follow articles as they are published. NPQ and YNPN will be using the hashtag #EDISeries, so post about the series along with us. To stay informed on the project, we encourage readers to sign up for our daily newsletter on the right side of this page. If you have any questions or would like more information about the EDI Project, please email [email protected]. According to the National Endowment for the Arts, the arts (performing, visual, and literary) contribute $698 billion to the U.S. economy each year.3 Numbers, of course, cannot tell the whole story. On a balance sheet and income statement, numbers represent the salaries of artists and technicians—and every new space built with community development grant dollars signifies living and breathing members of a community. Directing acting ensembles, hanging a spotlight high above the stage, and running a busy box office all require intensive collaboration. Indeed, theater work requires a tremendous amount of teamwork, and makes for a unique atmosphere in which EDI will either thrive or fail. Theaters collectively choose their seasons of plays, write value statements about identity (i.e., gender, race, sexual orientation), and create policies and practices that influence the culture of the organizations. Theater largely presents as a shining liberal beacon. Progressive values are touted as hallmarks of the industry. All opinions are supposedly accepted, and it is generally viewed as the most open of the arts because of its sense of adventure and boldness around the work created. The picture of the field of theater at large tends to look very elegant in its representation of equity, diversity, and inclusion. But there are many hidden ways in which the various “isms” (racism, sexism, ageism, and a whole host of others) manifest themselves. We write this article at a point when, between the two of us, we have worked both as artist and administrator in over thirty theaters. We have done so as interns, fellows, full-time staff members, volunteers, and executive leaders. We have seen hundreds of plays at any number of theaters, national and international. And, as professionals of color, we’ve not only read about diversity and discrimination in the press and studied it in school but also have lived it in the workplace and in our daily lives. We’ve encountered surprise and disbelief that we are so well read in dramatic literature or that we’ve attended competitive graduate school programs. As staff members at theater organizations, we’ve rarely had supervisors of color, we’ve been told we are too “threatening” or “hostile,” and we’ve repeatedly had our concerns about EDI ignored or brushed aside. Just as in our educational and financial systems, the American nonprofit regional theater industry has a long history of structural racism and inequity in its programming, staffing, and business practices. As people of color working in the nonprofit theater industry, we wanted to take a step back and reflect on—and share—some of the efforts around EDI made by a variety of nonprofit regional theaters that have resonated with us. These case studies are not all-inclusive but rather represent a wide range of institutional responses to the EDI problem in American theater. The powerful actions and accomplishments of these companies inspire confidence that progressive social change is not only possible in our field but within reach of organizations willing to work for it. This comprehensive approach is inspiring to us because of our experiences working with organizations in which only one or two departments are charged with working on diversity (usually the marketing or education departments) and with organizations that have overtly refused to incorporate antioppression or EDI training in their professional development for staff. These kinds of efforts are important because of the persistence of microaggressions: the everyday verbal, nonverbal, and environmental slights, snubs, or insults—intentional or unintentional—that communicate hostile, derogatory, or negative messages to target persons based on their marginalized group membership.12 We’ve experienced a number of microaggressions in the business over the years. We’ve been told that a play will appeal only to a specific cultural group and that the theater cannot possibly convince that group to come to the theater. We’ve been told that there are no experienced designers (scenic, lighting, costume) of color. We’ve been laughed at while presenting a concern about discrimination, and been mistaken for interns while working as full-time staff members. We’ve been told to smile more, and that we don’t “sound like” we’re Black. We’ve had punitive action taken against us for reporting gender-based harassment, disclosing a disability, and expressing opinions based on our unique cultural backgrounds. We get a kick out of social media and entertainment blogs like BuzzFeed and Tumblr that chronicle microaggressions in the staff break room and white fragility in business meetings.13 Sometimes you’ve got to laugh to keep from crying! Cultivating a diverse staff is a good first step that must be paired with antioppression and EDI training, so that the diversity created has longevity and thrives in a positive environment. Theatre Communications Group (TCG), in New York, operates as a national field organization for nonprofit theater. Recently, TCG has intensified its focus on EDI, but Dafina McMillan, former director of communications and conferences, says that diversity has always been embedded in the fabric of the organization: “TCG has always served a diverse field and [diversity] has remained a core value. TCG can centralize the field and adopt a challenge of greater inclusion in the field.”14 McMillan explained further that TCG had recently completed a strategic plan and has launched and advanced several programs to address issues of EDI in the field. This includes their SPARK Leadership Program, created in 2014, which seeks to highlight and provide professional development opportunities to rising leaders of color in theater. In 2013 TCG formed their Diversity and Inclusion Institute, to gather together theater organizations that were interested in creating EDI action plans. This cohort of theaters meets periodically throughout the year, and TCG recently acquired funding to continue the institute’s work. TCG has placed an emphasis on nurturing theaters of color, and in 2014 began an ongoing video project that highlights legacy leaders of color such as Luis Valdez, Lou Bellamy, Frank Chin, and Douglas Turner Ward. And in June 2015, TCG acquired funding for an associate director of equity, diversity, and inclusion to oversee its EDI efforts. McMillan believes that TCG’s programs have a galvanizing effect on the field: “The conversations are more nuanced and the field wants to work together and strategize. Funders see it and want to do something about it. There is a hunger happening in the field for EDI.”15 One of the most profound developments currently at TCG is the organization’s focus on creating a demographic survey that investigates how theater practitioners identify themselves. The survey is being developed by August Schulenburg, the director of communications and community engagement at TCG. “We have to honor people’s complex identities and empower people to self-identify,” McMillan said.16 TCG specifically focuses on nine points of identification: ability/disability; age; class/educational background; gender; place of origin; race/ethnicity; religion/spirituality; and sexual orientation. The survey will provide an accurate picture of the demographic makeup of theater professionals. TCG plans to launch this innovative tool soon, intent not only on measuring aggregate changes but also on changing the way that we measure individuals. East West Players, in Los Angeles, is one of the oldest theaters of color in the United States still in existence today. In January 2016, Tim Dang, the theater’s former producing artistic director, released a document called the “51% Preparedness Plan for the American Theatre.” Snehal Desai, the theater’s new artistic director, explained that the purpose of the plan was to “shake things up.”17 It was a place to start the conversation and encourage theaters to look at their numbers. 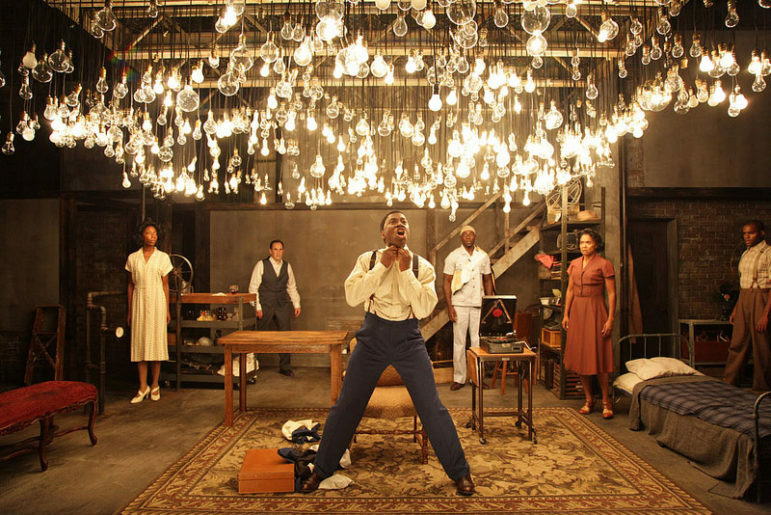 Fifty-one percent of the artistic and personnel staff are people of color. Fifty-one percent of the artistic and personnel staff are women. Fifty-one percent of the artistic and personnel staff are under the age of thirty-five. For Desai, the future of the field lies in intersectionality: “People are multivaried,” he said. “People do not enter a room checking only one box.”20 Indeed, both in the field and personally, we have seen how intersectionality functions in various settings. As a colleague of ours has noted, “I don’t enter a room just as a woman and leave my Black person behind.” The next challenge that faces the field—and, arguably, the country—will be around how to confront multiple identities and recognize the wholeness of a person. Produce at least one production per season written by a Latino playwright as part of DTC’s mainstage season. Ensure that DTC’s Brierley Resident Acting Company is comprised of at least 50% diversity by hiring more people of color. Ensure non-traditional (color blind) casting in all productions. Guarantee that at least 25% of all teachers/teaching artists in SummerStage and Project Discovery are people of color. Hire at least two people of color to direct and/or choreograph productions as part of the mainstage season. According to Howard, full-company meetings at DTC always have a diversity component—a reading, a workshop, or some other educational component by which the company learns about various people in the field who have helped further EDI, such as Joseph Papp, founder of The Public Theater, in New York, and Lloyd Richards, theater director and former dean of the Yale School of Drama. While an unconventional and creative workplace, to be sure, theater is not exempt from stress and burnout among its workers due to such oppression; and it may surprise some to discover that theater, like any other industry, has its share of discrimination lawsuits and alienated audiences and donors due to a lack of attention paid to EDI. While the work that must be done seems daunting and incremental at times, now is the time to begin making major changes. The organizations we have profiled here are part of the seismic shift needed to maintain a vibrant future for the American theater—one that represents our multicultural nation and presents stories that matter to a multiplicity of its citizens. We call for other organizations, artists, and leaders to take a hard look at their audience demographics, workplace culture, and programming. Careful and sober assessment is the first step to solving the pervasive problem. But we cannot stop at studies, seminars, and meetings. Action must be taken, and it must be taken now. The very power and impact of theater in American society are at stake. Zannie Giraud Voss and Glenn B. Voss with Ilana B. Rose and Laurie Baskin, Theatre Facts 2014: A Report on the Fiscal State of the U.S. Professional Not-For-Profit Theatre Field (New York: Theater Communications Group, 2015). “Surprising Findings in Three New NEA Reports on the Arts: Exploration into who participates and why, as well as the arts as an economic engine,” January 12, 2015, National Endowment for the Arts. Marsha Norman, “Why The Count Matters,” Dramatist, November/December 2015. Chay Yew, in an interview with Jocelyn Prince, November 7, 2015. Don Aucoin, “Phantom of the Theater: Audience Is Getting Older,” Boston Globe, June 17, 2012. Claudia Alick, in an interview with Jocelyn Prince, October 26, 2015. Bill Rauch et al., “Oregon Shakespeare Festival Audience Development Manifesto,” March 30, 2010. Chay Yew, in an interview with Jocelyn Prince, November 12, 2015. Derald Wing Sue, “Microaggressions: More than Just Race: Can microaggressions be directed at women or gay people?,” Microaggressions in Everyday Life (blog), Psychology Today, November 17, 2010. Heben Nigatu, “21 Racial Microaggressions You Hear On A Daily Basis,” BuzzFeed.com, December 9, 2013. Dafina McMillan, in an interview with Al Heartley, October 28, 2015. Snehal Desai, in an interview with Al Heartley, November 5, 2015. Martha Elena (Mel) Howard, in an interview with Jocelyn Prince, fall 2015. “Diversity Action Plan,” Diversity & Inclusion at Dallas Theater Center, Dallas Theater Center website, accessed September 8, 2016. George Hutchinson, ed., The Cambridge Companion to the Harlem Renaissance (New York: Cambridge University Press, 2007). August Wilson, “The Ground on Which I Stand,” keynote address at the Theatre Communication’s Group 11th biennial conference in June 1996, published in Callaloo 20, no. 3 (Summer 1997): 493–503. Jeff Yang, “Yellowface staging of ‘Mikado’ has to end,” Opinion, CNN, July 17, 2014. Laura Collins-Hughes, “Internet Outcry Over Diversity Leads Manhattan Theater Club to Announce Season Details Early,” New York Times, Aug. 20, 2015. María del Carmen Triana, Tiffany M. Trzebiatowski, and Seo-Young Byun, “Individual outcomes of discrimination in workplaces,” in Adrienne J. Colella and Eden B. King (eds. ), The Oxford Handbook of Workplace Discrimination (New York: Oxford University Press, 2015); and see David L. Blustein, ed., The Oxford Handbook of the Psychology of Working (New York: Oxford University Press, 2013). Karen Grigsby Bates, “Q&A With The Black Twitter Engineer Who Left Over Diversity Problems,” Code Switch, Race and Identity, Remixed, National Public Radio, November 6, 2015. Irma Mayorga, in private conversation with Al Heartley, spring 2011. Al Heartley is an MFA candidate for theater management at Yale School of Drama. Al is a member of the Yale School of Drama’s Equity, Diversity, and Inclusion Working Group, and has worked at the Cleveland Play House and at the Steppenwolf Theatre Company and the Writers Theatre, Chicago. Jocelyn Prince is site coordinator for Almira PreK-8 Academy in the education and artistic departments of the Cleveland Play House. Jocelyn was cofounding artistic director of The New Black Fest, New York, and has worked at Woolly Mammoth Theatre Company, Washington, D.C., the Public Theater, New York, and the Steppenwolf Theatre Company, Chicago, among others. We hope that these articles will challenge all nonprofits to think differently about their organizations and fields and all funders to consider what workforce problems they are supporting by the choices that they make and the questions they neglect.